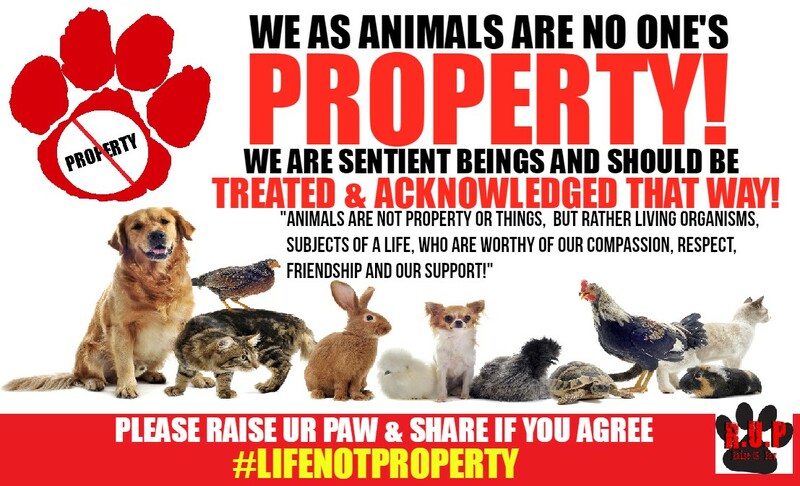 RAISE UR PAW NEWS: ANIMALS ARE NOT PROPERTY: Make The Stand Today! We at Raise Ur Paw, A Canadian Federally Incorporated Not-For-Profit, are working towards the removal of the label "Property" from the description of innocent animals, and extending our reach to Government Officials to support and take part in seeing and acknowledging our voiceless as sentient beings. For way to long, the social attitude towards animals has indeed been one that is very confusing and in many cases bias -- observing some as family members/pets, and in another breathe viewing others as mere "benefits to humanity" (eg. food, entertainment, scientific sacrifices, along with other countless uses) leading to the creation of different laws and protection for different species of life. But in all honesty, it is this response and way of thinking that is truly interfering with permanently stoping these inhumane and cruel actions against animals, because of the loopholes that the label "property" and the words "benefits to humanity" create within our laws -- and the fact that many believe that it is morally wrong to inflict suffering, torture, pain and death upon innocent life and yet make reasons and excuse the actions against others -- even if we can clearly observe that they are visibly wrong. Let's take a look for a moment at our Justice and Legal Systems, sure they have created such laws to protect animals -- but they too have played their roles in extending the confusion by highly limiting the type of legal protection and security that we give to our voiceless (protection of one, but excuse the actions of others), permittance to allow innocent lives to suffer due to reasons such as "benefits humanity", leaving open the inability to fully protect all species due to restrictions and excuses, giving offenders less consequences and punishments for their crimes, and even exemptions that allows & protects such industries, corporations etc. from facing any kind of punishment. 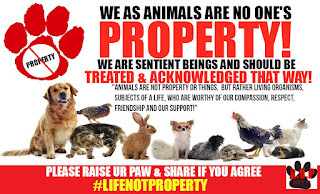 Just with these issues and concerns alone, should enhance our determination and pressure to remove the label "property" from upon these sentient beings and make the stand to increase the power of authorities, update laws and strengthen consequences against such actions, whether against an individual or a huge corporation -- cruelty is cruelty, with no exemptions or excuses. Extending the pressure to Government officials and urge them to remove such label as "property" from upon the innocent, update and strengthen laws, enforce stiffer consequences and punishments for acts of such crimes, and gain support from these political influences to make the stand and be a voice for animals worldwide. Raise Public Awareness on the issues and concerns at hand, whether through campaigning, protesting or just sharing valuable and imperative information that can increase the support and attention of society and individuals. Be actively involved with other animal rights organizations, or create your own group etc raising support and voices from other individuals sharing the same interests and compassion for animal rights and welfare. Create Petitions, flyers, posters - creative ways to gain attention against the issues at hand. Even the littlest bit of assistance and support can make a world of difference.